We are a social community with a focus on fitness. Our long hours and convenient classes cater to your busy life! Our spacious, welcoming facility has state-of-the-art workout equipment and a comfortable environment to encourage fitness and fun for all ages and abilities. We offer over 90 free classes and programs for all ages and fitness levels, from absolute beginner to seasoned enthusiast. Whether you want to build strength, work up a sweat, or gain flexibility, there’s a class for you. 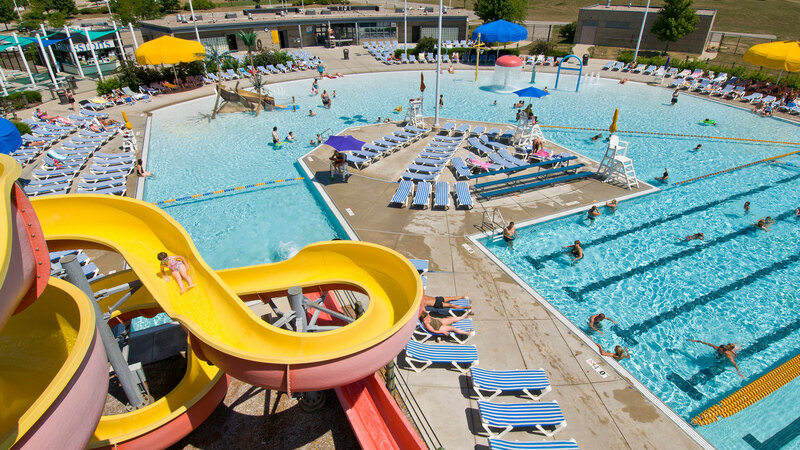 We offer a wide variety of programs, classes, and certification opportunities for all ages in our Zero depth, with 25 yard lap lanes and a 12 ft. diving well pool and aquatics facility, featuring an expansive pool, whirlpool, and waterslide.